The Ordos Plateau is a geographical region demarcated by the Yellow River's elbow section in the north and the Great Wall in the south (fig. 9.1). Administratively, it comprises mainly the Ih-Ju League of Inner Mongolia Region of the People's Republic of China. The sandy and denuded landscape of the plateau contrasts sharply with the adjacent areas - the Yellow River's elbow plain to the north and west, the loess hills and rocky mountains to the east, and the loess plateau to the south. 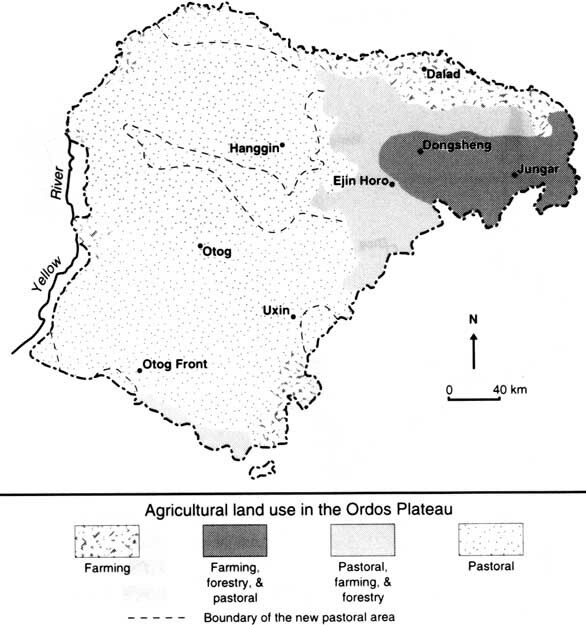 In 1988, as part of joint research undertaken by the Chinese Academy of Sciences and Clark University, the Ordos Plateau was chosen as a case-study of a potentially endangered zone. Building upon research conducted at the Chinese Academy of Sciences since the 1950s, data collection and field research addressed environmental changes and their human causes within the context of natural variability. Human dimensions of environmental changes in the Ordos, and especially human driving forces and societal responses, received new emphasis. This chapter examines environmental changes in the Ordos, their effects on society, and the human driving forces of and societal responses to these changes. It concludes with an analysis of the general environmental trajectory of the area and its implications. The Ih-Ju League of China has an area of 87,428 km�, most of which is covered by loose Quaternary deposit, easily disturbed and eroded. Sandy land develops easily and occupies much of the area. Base rock predominates in parts of the western high plateau. The Mu Us sandy land and flat valleys cover 28.8 per cent and the Hobq Desert 19.2 per cent of the region. The middle and west are denuded high plateau, accounting for 28.8 per cent of the total area. What is left is the loess hills in the east, accounting for 18.9 per cent of the area, and the Yellow River's alluvial plain (4.3 per cent of the area) in the north. Climatically, the area is dry and windy. Precipitation, 60-80 per cent of which occurs during the summer, is rare, averaging from 160 mm annually in the west to 400 mm in the east. The annual mean temperature is 5.3�C to 8.7�C, with high daily and annual ranges. Aridity is also marked. Windiness is another important factor: average wind velocity ranges from 2.0 to 4.3 metres per second (m/s), with the strongest at 18-28 m/s. Strong wind (>17 m/s) happens 20-40 days per year on average, with more than 100 days/year in extreme cases. Spring is the windy season and some 40 per cent of the strong-wind days of the year fall between March and May. Surface water is scarce in the Ordos. Most of the sandy land has interior drainage, with about 70 lakes that are largely salty and alkalized. Groundwater, by contrast, is abundant, especially in the Mu Us sandy land and the northern Hobq Desert along the Yellow River. Here the groundwater depth is less than 10 m, and even only 1-3 m in the valleys and inter-sand, dune-depressed locales in the Mu Us sandy land. Vegetation varies with climate and land-surface materials. From east to west, the vegetation proceeds from steppe to desert steppe to steppe desert. Vast areas of the Mu Us sandy land and Hobq Desert, except for their central exposed sand, are covered by azonal sandy steppe on sand-dunes, salix shrub in interdune locales, and meadow in valleys. Biomass changes with vegetation type and degradation and fluctuates with climate. Administratively, the Ih-Ju League contains seven banners (local administrative units), namely Jungar, Dalad, Hanggin, Ejin Horo, Otog, Otog Front, and Uxin banners, and one city (Dongsheng). The terms "league" and "banner," as well as the subunits "sumu" and "baga," suggest the Mongolian origin of the area, whereas city, township, and village refer to Han culture. Although the area is a Mongolian autonomous region, Han people actually dominate owing to migrations over recent decades. In 1989, of the total population of 1,184,148, 87.7 per cent were Hans and 12 per cent Mongolians. Farmers and shepherds make up 82.7 per cent of the population, and town and city dwellers account for 16.5 per cent. 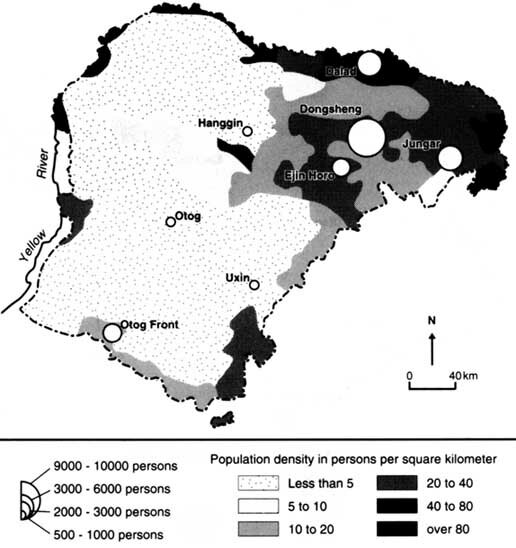 Population density is highly differentiated (fig. 9.2). In 1989, the average density was 13.5 people/km�, ranging from 1.4 in the west Otog steppe desert to 148 along the Yellow River north of Dalad. In the western four banners, people live in dispersed settlements over the vast pasture, with several kilometres between households being quite common. Education levels are low, especially for farmers and shepherds. In 1982, 35.4 per cent of the people over 12 years old were illiterate or quasi-illiterate. The Ih-Ju League is an agricultural area in terms of land use and occupation. In 1985, 76 per cent of the total area and 97.3 per cent of the utilized area were devoted to agriculture. Farming areas occur along the Yellow River alluvial plain in the north, the eastern loess hills area, and the southern river valleys of the Uxin Banner (fig. 9.3). Most of the western and south-western parts are pastoral lands linked by a transitional area of combined farming-grazing. Forestry includes the management of trees and shrubs and occurs mainly in the farming and farming-grazing areas. Of the total agricultural and industrial gross product in 1989, farming, forestry, and animal husbandry totalled 43.4 per cent, of which farming accounted for 37.8 per cent and animal husbandry 45.7 per cent, indicating a generally low level of productivity. In 1989, grain yielded only 1,935 kg/ha and oil-producing crops 1,020 kg/ha. Pasture has a low biomass (1,035 kg/ha in 1989). Agriculture depends mainly on naturally accumulated soil fertility and vegetation resources, and changes significantly with climatic fluctuations. Industry is strongly oriented to local resources. Although the Ordos has a marginal ecological environment, the Ih-Ju League is rich in coal, salt, and alkali. The three main coalfields - Jungar in the east, Dongsheng in the centre, and Zhuozishanin the west - contain 99.64 billion tonnes of proven high-quality coal deposits and constitute some of China's major coalfields. Coalmining developed very late in the Ordos, however, so that coal is still insufficient even for local power plants. Salt and alkali production and wool textile mills are also small-scale enterprises as reflected in overall current economic production but promise a large future potential for development. Environmental problems in the area are mainly non-point problems, induced by land exploitation. Therefore, agriculture, involving the overwhelming percentage of land, has provided a key proximate source of environmental change. This has been true in the past and will likely continue to be so in the foreseeable future. Therefore, agriculture will be the focus of this study of environmental changes in the Ordos. Industry, which plays a part in environmental change mainly through its interaction with agriculture, has not yet become a significant source of regional pollution. As already emphasized, the economy of the Ih-Ju League rests primarily on local resources. Material exchange with other regions is very limited. Output from the area consists mainly of animal-husbandry products and coal, whereas imports from other regions (as shaped by government regulation) are mainly staples (grain) and financial aid. The national government regulates these spatial linkages. According to the national plan, the state is currently investing heavily in coalmining, which is likely to develop rapidly. Another spatial linkage involves the discharge of sand and silt into the Yellow River, affecting its lower reaches. The Ordos is a naturally marginal and economically backward area, characterized by semi-arid, arid windy, and sandy natural conditions. It has a low-level agricultural economy and a tangential relationship with other regions. Agricultural practices account for environmental erosion and vegetation and soil degeneration in the region. This contrasts sharply with the "modern" environmental problems treated by Ezcurra and colleagues in chapter 7. Although the overuse of fertilizer prevails in many developed countries and has presented a particular problem in the Aral Sea basin (chap. 3), the Ordos has insufficient fertilization. The driving forces of environmental changes in the Ordos come mainly from farmers and shepherds. This is typical of many endangered areas in China and in other developing countries. Therefore, this chapter will explore the relationships between human factors and environmental problems applicable to this type of setting. Economic specialization does, of course, matter in the Ordos. Indeed, abundant mineral resources in the Ordos present a great opportunity for industrial and economic development, although realization of this potential requires economic drive. Other special factors in the Ordos include a long history of human activities, a hierarchical national political economy, and a centralized political system. All these play their roles in the unfolding of environmental change. Since the socio-economic forces and regional dynamics of environmental change are the focus of this study, they provide criteria for defining the time-scale of analysis. Therefore, the time-period during which human activities have profoundly affected the present Ordos environment, or, in other words, have formed today's life-supporting ecological system, is the period of primary emphasis. The earlier, less significant periods will be considered largely as context. In the Ordos Plateau, the period of strong human impact has spanned the last 40-50 years. The year 1949 marks an important turning point, when both the social and economic systems began to change greatly, causing a sudden increase in the intensity of human activity. The existence of economic statistics aside, another reason for choosing the base time of 1949 is the availability of data recording natural factors from that year forward. The Ordos is geologically a part of the north China platform. In the Quaternary, it underwent a warm-humid and cold-dry alternating semiarid climate, with a general tendency toward aridity. Loess deposition and windy sand occurred in dry periods, whereas vegetation covered the land during humid periods. For example, the early Neocene (10,000-7,000 years B.P.) was cold and dry, and moving sand covered much of the area, whereas 6,000-4,000 years B.P. was a warm and humid period, so a steppe emerged, moving sand became fixed, and palaeo-soil developed. In 3,000-1,500 years B.P., a dry climate returned and moving sand spread south of what came to be the Great Wall. Another favourable climatic period spanned 1,500-1,100 years B.P., when moving sand shrank and the steppe expanded. After 1,000 years B.P. the fluctuating climate became slowly drier. Although human activities became more aggressive in the processes of environmental evolution, environmental changes remained largely the product of natural changes, and especially those induced by climatic variability. Humans first inhabited the area in the era 35,000 years B.P. in the Wuding Watershed. It was the home area of several northern nomadic minorities, such as the Xiongnu (Hun) and Mongolians. Though some scholars believe that farming originated in the area in the Zhou Dynasty, most believe that the area remained nomadic until the Hans began practicing cultivation in the Warring States (474-221 B.C.) and the Qin Dynasty (221-207 B.C. ; Jiang et al. 1986; S. Zhu 1986). Having unified China, the Qin Dynasty became strong enough to extend its power to the frontier area, including the Ordos. After conquering the area, the Qin central government moved Han people to reclaim and cultivate the east of the Ordos. The Western Han Dynasty (206 B.C.-A.D. 24) continued the frontier-consolidation policy and cultivation activities. From the Eastern Han (A.D. 25-220) to the end of the Northern Dynasties (A.D. 581), a decline of governmental power led to a loss of control over these marginal areas. The nomadic minorities retook the area and the Han people moved back inland, thereby abandoning croplands and promoting the regeneration of pasture. In the Sui and Tang Dynasties (A.D. 581-907), the Han government reoccupied the Ordos, settling people, stationing an army, and promoting reclamation. With a policy stipulating that a newly opened field should not be taxed for five years, farmers generally abandoned land and turned to other pastures (Jiang et al. 1986). This had far-reaching environmental effects at the time. During the Ming Dynasty (A.D. 1368-1644), farming was practiced only on the southern edge of Ordos. At the beginning of the Qing Dynasty (A.D. 1644-1911), the Great Wall marked the boundary between farming and grazing, with agricultural activities forbidden in a 25 km strip along the wall, and Han people were not permitted north of the Great Wall. Owing to natural disasters and political decline, however, the people in Northern Shaanxi lived poorly and often migrated illegally to the Ordos to make a living through cultivation. In 1697, Han men were permitted to cultivate north of the Great Wall, but they had to return to their homes in winter (women were still banned from migrating). The corruption of the Qing and Minguo governments sparked a rapid expansion of farming, beginning in the mid-nineteenth century. In order to increase taxation to meet financial difficulties, the Qing government ordered the Mongolian area opened and permitted Han people, including women, to move into the Ordos. A "Reclamation Affairs Company" was set up, and large tracts of pastureland were opened. The Yellow River's elbow plain was also cultivated. In the Minguo period, this reclamation policy continued and caused overt reclamation until 1949. This very brief history provides some background for this environmental study. Since agriculture originated in China 7,000 years ago, many relevant factors can be traced far into the past in the Ordos. The reclamation activity of the Qing and Minguo had particularly important effects. In the Ordos, major forms of environmental change include sandification, vegetation degradation, soil erosion, and soil degeneration. Although these changes are closely interrelated, each has some distinctive properties. Sandification is a process by which utilizable land is converted into or covered by sandy land, indicated by soil coarsening, enlargement of sand cover, and declining productivity. It involves two processes: sand erosion (mainly aeolian) and accumulation. The classification of the Lanzhou Desert Institute of the Chinese Academy of Sciences distinguishes among three grades (serious, medium, and light) according to the percentage of moving and fixed sand, vegetation cover, and soil nutrients. Most of the Ih-Ju League suffers from sandification (fig. 9.4). 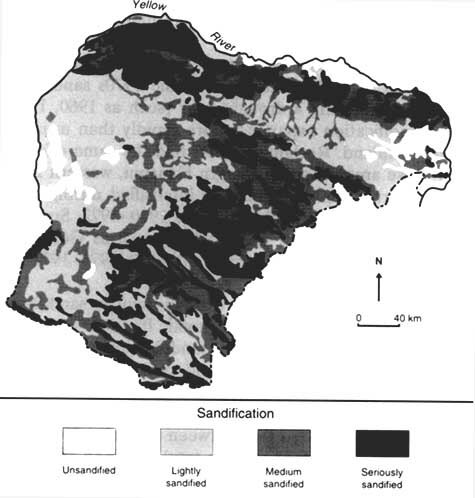 Seriously sandified areas occur mainly in the Hobq Desert and northern parts of the Mu Us sandy land. In Uxin-Ju, Gelute, and Ulan-Taole-gai sums of Uxin Banner, for example, seriously sandified areas account for as much as 50 per cent of the land. Moderately sandified areas are found mainly adjacent to or mixed with more seriously affected areas. Other parts of the League, owing either to a lack of sandy material and less strong winds or to less human pressure, are mostly lightly sandified or unsandified. In South Dalad, Dongsheng, and Jungar, more abundant water is the chief reason for the lighter sandification. Since the classification of sandification is somewhat subjective, data from different sources about sandified areas are not consistent. They all show a general trend, however, toward increasing sandification from 1949 to the end of the 1970s. According to the Lanzhou Desert Institute's aerial photo interpretation (Yang et al. 1991), moving sand increased from 16,446.5 km� in 1957 to 27,660 km� in 1977 in the Ih-Ju League, the annual increment being 561 km�. In 1957, the width of the Hobq Desert was 10-40 km, with an area of 16,200 km�, whereas in 1977 it had increased to 30-65 km wide and 16,757 km� in extent. Over the same 20 years, the Mu Us sandy land expanded south-eastward by 3-10 km. Sand-dunes also became higher and the interdune low land narrower. Sandification processes varied over time and space before the 1980s. Generally, from the late 1950s to the 1970s sandification occurred rapidly. Following a drought year (such as 1960, 1962, 1965, and 1972), sandification expanded more rapidly than usual on both pasture and farmland. Reclamation has had the same effect, for example, for those areas of south-eastern Hanggin, western Ejin Horo, and north-eastern Otog. Sandification intensified during periods of over-reclamation in 1957, 1959-1961, and 1970-1972. Some western areas with less than 250 mm precipitation, such as Gongqirige and Shanghaimiao sums, quickly sandified after the 1970-1972 reclamation. The period 1978-1980 marked a turning point in sandification. In the 1980s, with greater social and economic freedom associated with the household responsibility policy, sandification slowed, even reversed in some locales. Improved and recovered areas exceeded newly sandified areas. According to Bo Li et al. (1990), from the 1970s to 1984 the sandified area remained almost constant. Gensheng Yang et al. (1991) concluded that between 1981 and 1986 both moving sand (seriously sandified) and the total sandified area decreased in the Ih-Ju League. Vegetation changes are characterized by pasture degradation, revealed in a decline in coverage, height, and biomass; simplification of species composition; reductions in high-quality plants; and increases in poor-quality species. According to Bo Li et al. (1990), degraded pasture was 65.6 per cent of the total utilizable pasture area (table 9.1) in 1980, and, of this, 51.79 per cent of the total utilizable pasture was seriously degraded. Most pasture area has been degraded since 1949, especially from the 1960s to the end of 1970s. From 1966 to 1979, in the whole Ih-Ju League, pasture biomass declined by 26 per cent, and the pasture area, owing to reclamation and sandification, shrank by 17 per cent. Jingye Zhang (personal communication, 1991) estimates that, in the early 1970s, moving sand swallowed 2,000 km� of pasture every year. Regional differences in pasture degradation are apparent. Typical steppe vegetation has become seriously degraded. Second to this in importance are the sandy steppe and meadows in the Mu Us and Hobq Desert. Shepherds remember that the Achnathrerum splendens was high and dense enough before the 1960s to hide cattle and horses, but by the late 1970s had become so short and sparse that even a running rabbit was visible. In the Hantai valley of the Dalad Banner the Caragana leucophloea oasis teemed with wildlife, such as Mongolian gazelle, fox, rabbit, and various migrating birds. With environmental destruction, most of this wildlife has disappeared. Since the early 1980s, measures to protect and recover pasture vegetation have slowed degradation correspondingly and, between 1985 and 1989, biomass declines even halted. Source: Adapted from Li et al. (1990). Water and wind are two powerful forces of soil erosion. Water erosion affects mainly the eastern river catchment, whereas wind erosion affects most other parts. The transitional area between these two parts is affected by both water and wind. In so far as wind erosion, a part of the sandification processes, occurs simultaneously with aeolian accumulation, its extent is relevant to sandification. Strong wind erosion occurs on the high unprotected plateau crop fields, whose average erosion depth is 5-7 cm per year. Moving sand-dunes march 310 m along the wind direction every year. Vast areas of sandy land, desert, and high plateau in the Ordos suffer from serious wind erosion. Water erosion dominates in the eastern area. Western and south-western Jungar Banner are severely eroded. Above the rugged Tertiary silt sand and shale rock is only 20-30 cm of loess layer on average. In many places, the loess has been totally eroded, with bedrock exposed and the land unutilizable. The total erosion area has increased. The data from the Water Conservancy Centre of the League show that from 1949 to 1983 the area of erosion increased, and even accelerated from 1958 to 1978. Though measures have been taken since 1980 (as described below), soil erosion persists. Soil degeneration results from soil erosion. According to Zhaohua Huang and colleagues (1986), the organic material of dry cropland has decreased by 20-30 per cent since the 1960s, and total nitrogen has declined by 25-46 per cent. In the cropfields of aeolian erosion areas, the topsoil has been stripped away by an average of 5-7 cm every year. Water erosion has stripped some 1-4 cm per year off cropfields. It has been estimated that, even under vegetation protection, the formation of 2.5 cm topsoil will need about 300-1,000 years, or even longer. By comparison, soil depletion in the Ih-Ju League is proceeding even more rapidly. Erosion measurements have been taken since 1983. Erosion-controlled areas have balanced much of the newly eroded area. The late 1980s witnessed more significant erosion control and land-improvement measures but, owing to the slow speed of soil column building as compared with other environmental changes, soil fertility is recovering only slowly. Therefore, although other environmental problems have been mitigated since the early 1980s, soil depletion still continues. The changing environmental factors discussed above are closely interrelated. Some other factors, such as air, dust, and sand storms, actually accompany wind erosion and sandification. Changes in land surface albedo caused by sandification and soil exposure also exacerbate drought. All these changes combine and interact to degrade the whole ecosystem, the total deterioration of which shows up in declines in productivity and carrying capacity. Vegetation plays a particularly important role in such deterioration. It not only is the major object of human disturbances but also provides a major medium for human improvements. On the one hand, deterioration begins when vegetation is disturbed. Experiments show that, as compared with sand, when vegetation cover reaches 15-25 per cent, the amounts of transported sand will be reduced to 22-31 per cent. When vegetation cover is 40-50 per cent, the amount will be reduced to only 1 per cent (Yang et al. 1991). On the other hand, controlling environmental deterioration relies principally on the protection and reconstruction of vegetation. The good news is that the environmental deterioration of the Ordos is retrievable, either by natural regeneration after a halt to exploitation or by deliberate human reconstruction of the vegetation. Unlike the tropical rain forests, the destruction of which may interfere with climatic processes and material recycling so profoundly that regeneration mechanisms may be totally destroyed, environmental deterioration in the Ordos has not ruined the possibility of recovery. Precipitation levels of 160-400 mm provide the necessary conditions for vegetation regeneration or reconstruction. Although it is doubtless true that destruction is easy and recovery difficult, a rapid recovery needs human effort in planting and reconstruction. Generally, environmental restoration is technologically feasible. As for the causes of environmental changes in the Ordos, competing opinions exist. Using a geological time-scale, some opinion focuses on natural trends of aridity. Disputes over the causes of such environmental changes over historical time are apparent. In his paper on the formation of the Mu Us sandy land, Yongfu Zhao (1981) argues that natural conditions have played a dominant role, whereas human activities have had only slight impacts. Guangrong Dong and colleagues (1983) also believe that human activities are secondary to natural influences. Shiguang Zhu (1986) and Nianhai Shi (1980), on the other hand, put a heavy weight on human factors. Gensheng Yang and colleagues (1991) have even calculated the percentage of human causes, which they set at 87 per cent for sandification changes since the 1960s. On the basis of climatic aridity through historical time, these authors conclude that human activities have accelerated the natural environmental changes more and more significantly. Since too little time has elapsed since 1949 to show any clear trend in a fluctuating ecosystem, the intensity of human activities has played a dominant role in environmental changes. However, no clear boundary emerges between the interwoven factors of natural background and human causes. For a region like the Ordos, whose socio-economic system relies heavily on its natural environment, environmental deterioration directly degenerates the human-support system and can cause profound human dislocations, especially for farmers and shepherds. According to Bo Li et al. (1990), declines in cropland fertility greatly affect agricultural productivity. From 1949 to the early 1970s, yields averaged 300-530 kg/ha, but some slope land and sandified field yields were only 75-150 kg/ha. From the mid-1970s, crop yields have increased gradually, but productivity has remained low. Although the slow infusion of technology and human interventions have largely compensated for the negative effect of environmental deterioration, farming developments have lagged seriously. Examples include the severely water-eroded areas in west Jungar, where the soil has been so thin as to expose baserock in many places. Cultivation cannot be practiced in many lands. As a result, farmers have migrated to other places in search of better land or other economic opportunities (Deshengxi township is one such case). Wind erosion and sandification impede crop production by eroding topsoil, manure, and seeds (sometimes, a field has to be resowed three, four, or even five times). They also directly destroy crops, causing significant declines in yields. One estimate indicates that fully one-third of cropfields suffers from sandification every year (Huang et al. 1986). Pastoral degradation and the shrinkage of pasture area directly affect animal husbandry. Given the degradation of pasture, the number of livestock has not increased with population growth. Rather, it has fluctuated with climate change and other natural factors. The per capita level of livestock has actually declined. Meanwhile, pasture area per livestock has fallen sharply, from 3.6 ha in 1949 to 1.1 ha in 1985, and also has one-third less biomass. Overgrazing in the forage period (summer and autumn) has resulted in decreased livestock weight, causing a drop in production. For instance, the average one-year-old sheep in the early 1980s weighed only 72 per cent of one in the 1950s (Zhu et al. 1986). Prior to the establishment of pasture user rights in 1980, some shepherds on degraded pasture were forced to graze their livestock hundreds of kilometres away, causing not only a waste of livestock energy but also pasture degradation. Per agricultural capita GNP/ cap. GSAP/ agr. cap. ANI/ agr. cap. Source: Adapted from Ih-Ju League (1990). The effects of environmental deterioration on the regional economy are apparent in the stagnant GNP/per capita, gross social agricultural product (GSAP), and agricultural national income (ANI) for the agricultural population (table 9.2). These economic indicators fluctuated, without any general increase, up to the 1980s. The economic gains of the 1980s, which were largely attributable to socioeconomic developments, also reflect recent environmental improvements.  The Huqutu Reservoir is a medium-sized reservoir in Jungar Banner. In 1975, when construction began, the maximum depth of water was 25 m. Owing to serious soil erosion in the catchment, it soon became shallow (4 m in 1977 and 1 m in 1980). Before the conveyance irrigation system was completed, the reservoir had silted up, at a cost of about 400,000 yuan in national investment (Shen 1981).  The Xiliu stream is a short tributary from Dalad running northward to empty into the Yellow River. In ordinary times, cars can cross the stream bed. The sparsely vegetated catchment is, however, seriously eroded. In 1961, over 200 mm rain between 21 and 23 August caused serious flooding and silting, washed away seedlings on more than 26,000 ha, and buried 8,670 ha of cropfield in thick sand. Eleven villagers drowned and more than 8,000 houses collapsed. The amount of sand carried by the water was so extensive as to form a sandy dam that cut off the flow of the Yellow River for three hours, raising the river level by 405 m and inducing significant effects on both the upper and lower reaches. Similar floods occur about two to three times every 10 years (Shen 1981).  On 28 April 1983, a sand storm in Ih-Ju League left 4 people dead, 37 people injured, 44,837 livestock dead, 101 houses and 378 livestock shelters destroyed, and 195 wells buried (Yang Gensheng et al. 1991). Sand storms happen on average about 10-25 days per year. Over 200 km of roads suffer from sandification each year, and sand-clearing costs over 1 million yuan annually (Huang et al. 1986). The Ordos Plateau is a major sand deposition area of the Yellow River catchment. The serious sandification and erosion add greatly to the silt discharges, especially the coarse, sandy deposits of the Yellow River. It is estimated that the Ordos accounts for 10 per cent of silt discharges and one-third of the transport of coarse sand for the Yellow River. In short, environmental changes in the Ordos affect deposition in the Yellow River, thereby endangering the lower areas of the river.